Wraps are the perfect power lunches. Not only are they portable and easy to customize, you can pack a heck of a lot of nutrition into a tortilla, lettuce leaf or collard wrap. They’re also easily made vegan, vegetarian or gluten free. 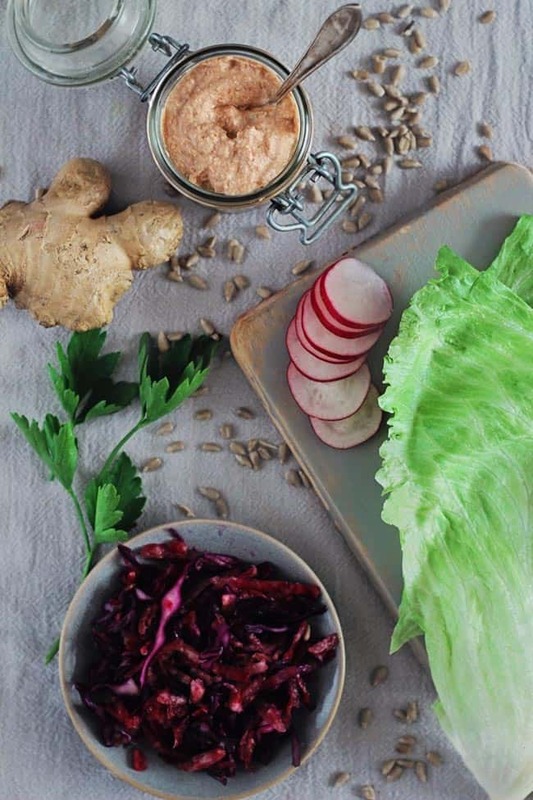 This wrap is a twist on the traditional hummus wrap, made with a savory, nutty sunflower seed spread. Sunflower seeds are one of the healthiest foods you can eat. (Who knew, right?) They’re full of protein (29 grams in 1 cup) and vitamin E, an antioxidant that helps support heart health and protect your body against toxins like air pollution (and can even help ease PMS and prevent diabetes). Minerals like selenium, manganese, copper and magnesium—which can help lower blood pressure and aid with detoxification—are also present at high levels in sunflower seeds. Pretty impressive for a tiny seed! 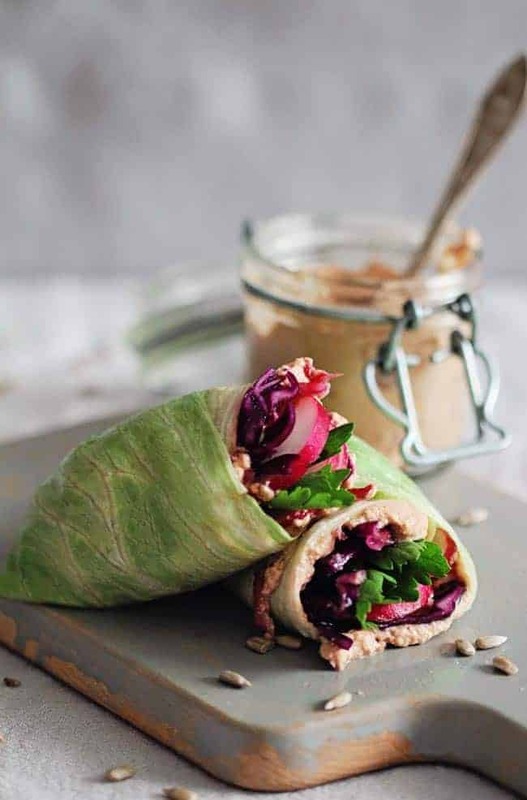 This easy, healthy lunch wrap recipe can be made with whatever veggies you have on hand, but crunchy radishes, sprouts and red cabbage work really nicely with the flavor of the sunflower spread. Wrap it all up in a lettuce leaf, collard leaf, nori sheet, thinly sliced zucchini or corn or flour tortilla, and you’re good to go for lunch! This detox-friendly healthy wrap is the perfect power lunch. other veggies - red cabbage, sliced peppers, etc. Drain the water from the sunflower seeds, and place the seeds in a food processor or blender. Add the remaining ingredients, and blend until smooth. Add 1 to 2 tablespoons of water to get desired consistency, if needed. To assemble your wrap, add 2 to 3 tablespoons of spread to your chosen wrap. Add desired toppings. Roll it up, and enjoy. For more power lunches, make sure to try our Kale + Avocado Hummus Wrap—and download our ebook, A Month of Healthy, Meatless Lunches, which has several amazing wrap recipes. Cute and healthy-plz check out my blog http://bizarrebutbrilliantbeautyrecipes.blogspot.com/ it would mean a lot!! The sunflower spread sounds delish!